a) Shrimant Sardar Malerao Holkar II Subadar Bahadur, Subadar of the Holkar Domains - see below. i) Shrimant Sardar Nathobarao Holkar Bahadur (surnamed Phanse before his adoption). Adopted by his grand mother Ahilyabai as her Heir-Apparent. m. (first) at Maheshwar Fort, 7th May 1780, Shrimant Akhand Soubhagyavati Balabai Sahib Holkar (b. 1772; d. by sati after the death of her husband, 16th November 1790), grand daughter of a brother of Ahilyabai. m. (second) Shrimant Akhand Soubhagyavati Gauribai Sahib Holkar (b. 1780; d. by sati after the death of her husband, 16th November 1790). He d.s.p. of consumption, 15th November 1790. 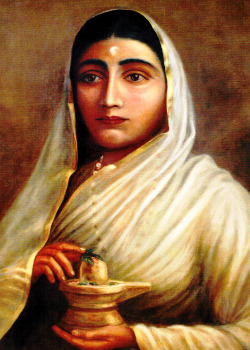 1) Shrimant Udabai Sahib Holkar (d/o Harku Bai). 2) Soubhagyavati Santubai Sahib Lambhate [Rama Bai] (d/o Harku Bai). m. Shrimant Sardar …Rao Lambhate, Saranjami Sardar and jagirdar of Machalpur. 3) Rajashri Bharmal Dada Sahib Holkar [Daasiputra]. Officer-in-charge Khasgi Dept at Maheshwar 1799. He d. aged 98 years. 1767 - 1795 Shrimant Akhand Soubhagyavati Devi Shri Ahilya Bai Sahib Holkar, Ruler of Indore*. b. at Chaundi, Jamkhed, Auzangabad, 1st April 1725, daughter of Shrimant Sardar Mankoji Shinde, Patil of Chaundi, in the Auzangabad district, by his wife, Shrimant Akhand Soubhagyavati Sushilabai Shinde, educ. privately. Assumed power as Regent shortly after the mourning period for her son in April 1767. Confirmed by the Peshwa in the family khasgi and inami jagirs, 11th December 1767. Established her capital at Maheshwar, and continued as joint (civil) ruler of the state until her death. m. at Chaundi, Jamkhed, Auzangabad, 1733, Shrimant Sardar Khanderao Holkar Subedar Bahadur (b. 1723; d. from a cannon shot during the siege (Jan-May 1754) of Khumbher, near Deeg, 27th February 1754), son and heir of Shrimant Sardar Malharrao I Holkar I Subadar Bahadur, Subadar of the Holkar Domains, by his principal wife, Shrimant Akhand Soubhagyavati Gautamabai Sahib Holkar, daughter of his maternal uncle, Shrimant Sardar Bhojiraj Sabaji Bargal, of Talode, in Khandesh. She d. at Maheshwar Fort, 13th August 1795 (succ. by her second husband), having had issue (see above and below). * Ahilya Bai is placed here as a ruler in her own right, in accordance with family tradition and subsequent historical writing. However, contemporary records from the Poona court indicate that the Peshwa appointed Tukojirao as the Subedar of the Holkar Domains, in succession to Malerao. Her true position being, at least as civil administrator of the family estates, at best as regent during Tukoji's frequent absence on campaign. 1) Shrimant Sardar Kashirao Holkar V Bahadur, Subadar of the Holkar Domains (s/o a legitimate wife) - see below. a) H.H. Maharajadhiraj Raj Rajeshwar Sawai Shri Harirao Holkar IX Bahadur, Maharaja of Indore – see below. b) Shrimant Rajashri Martandrao Holkar. a) Shrimant Akhand Soubhagyavati Mainabai Sahib. m. Shrimant Sardar Govind Rao, sometime cdt of a paigah at Cholee Mahasir, brother of H.H. Maharani Shrimant Akhand Soubhagyavati Ghainabai Sahib Holkar, daughter of Shrimant Sardar Sevajirao Girguna. She had issue, two children. 4) H.H. Ali Jah, Zubdat ul-Umara, Bahadur ul-Mulk, Farzand-i-Arjmand, Maharajadhiraj Raj Rajeshwar Shrimant Jaswantrao Holkar VI Subadar Bahadur, Nusrat Jang, Subadar of the Holkar Domains. - see below. 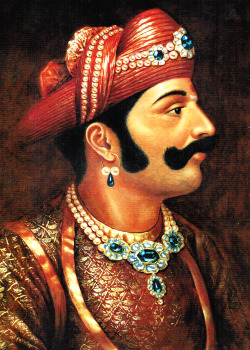 5) Shrimant Rajashi Kalsirao Holkar. He was k. at Beyigur, 1801. 1) Shrimant …Bai Sahib Holkar (full sister of Jaswantrao). She d. shortly after her brother, November 1811. 1797 - 1799 Shrimant Sardar Kashirao Holkar V Bahadur, Subadar of the Holkar Domains. b. 1764, eldest son of Shrimant Sardar Tukojirao I Holkar IV Bahadur, Maharaja of Indore, by his wife, Shrimant Akhand Soubhagyavati Devi Ahilyabai Sahib Holkar, educ. privately. Succeeded on the abdication of his father and invested as Subadar by the Peshwa, at Poona, 29th January 1797. Supported by Scindia in the succession dispute with his younger half-brother, but forced to yield a huge number of territories in return. Deposed during his absence from Maheshwar, by his half-brother, Jaswantrao, January 1799. Attempted a reconciliation and returned to Maheshwar in August 1801, but rejoined Scindia in September, by whom he was soon confined with other members of the Holkar family at the fort of Asirgarh. Subsequently released and allowed to live under the protection of Scindia in a house near Burhanpur, but later confined at the fort of Galna. m. (first) at the Rajwada, Indore, 1776, Shrimant Akhand Soubhagyavati ...bai Sahiba. m. (second) Shrimant Akhand Soubhagyavati Anandibai Sahiba (k. with her husband, before 16th February 1808). He was k.s.p. by Chimna Bhao Sahib on the secret orders of his brother Jaswant Rao Holkar, during the Bhil insurrection, in the mountains near Chandor, before 16th February 1808. 1799 - 1807 Shrimant Sardar Sawai Khanderao Holkar Bahadur, Subadar of the Holkar Domains. b. posthumously, at Poona, ca 24th November 1797 (two months after the death of his father), only son of Shrimant Rajashi Malharrao Holkar, by his second wife, Shrimant Akhand Soubhagyavati Jijibai Sahib Holkar, educ. privately. Seized by Scindia a few months after his birth, and thereafter kept confined at the fort of Asirgarh since July 1801. Proclaimed in absentia as rightful ruler by his uncle Jaswantrao, aafter he had seized control of the Holkar domains by deposing his brother Kashirao in January 1799. Released from captivity 24th March 1803, and turned over by Scindia to the guardianship of his uncle, Jaswantrao, 9th July 1803. Received at his uncle’s camp, where he received the fealty of the military and civil officers of the Holkar Domains, 12th July 1803. In 1805, he was surrendered as an honourable hostage by Jaswantrao to his Pathan officers as surety for the payment of arrears of pay due to the Deccan Horse, whom he had wished to disband. Proclaimed by them as head of the House of Holkar, but subsequently returned to the custordy of his uncle in September 1806 after the latter succeeded in exacting tribute from the Maharaja of Jaipur, which he then used to pay off his mutinous troops. He d. from cholera, at Shahpur, near Kotah, Rajputana, 22nd February 1807 (not without suspicion that he had been poisoned by Jaswantrao).